One of the greatest things about cooking at home is being able to control what goes in “it” and how much goes in. This holds especially true to desserts and its notorious heavy hitter, sugar. Well I have simplified a classic dessert and cut some, yes only some, it is still dessert of course, of the sugar down. 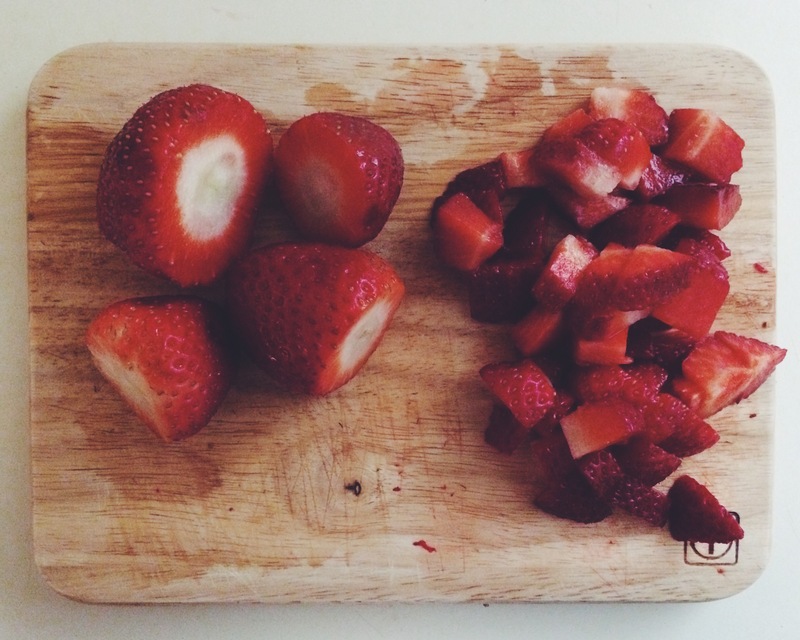 Fresh, in season, ripe fruit is a great way to keep the amount of refined or processed sugars down. These are so quick and easy you can make them on your lunch break, because that’s exactly what I did. I have a desk job and eat at home for lunch and I knocked these babies out in no time at all from start to finger-licking finish. Traditionally a napoleon is a triple-decker dessert packed with sugar, icing, cake and topped with more sugar (and much larger than these cute little 3 biters.). When roaming the streets of Europe the traditional is okay, but alas, I’m in Dallas, not walking anywhere. 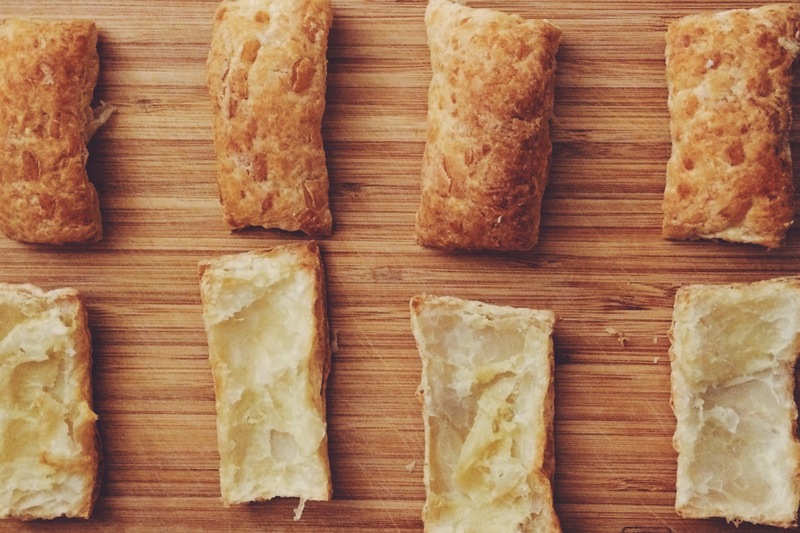 Let the frozen puff pastry thaw on your counter for about 45 minutes. It should still be cool but no longer frozen. Gently unfold the puff pastry on a lightly floured surface. Cut along the folds to create 3 even pieces. Cut the raw puff pastry into small strips. I cut mine into about 1 1/2″ x 4″ but you can eyeball it to whatever size you like best. Arrange the pieces on a baking tray lined with parchment paper. Bake for 15 minutes to golden brown and fluffy. The great thing about puff pasty is, it gets puffy and rises quite a bit while baking, hence the name. Take them out and let them cool. Once cool slice them in half, creating a top and bottom piece. Set aside. 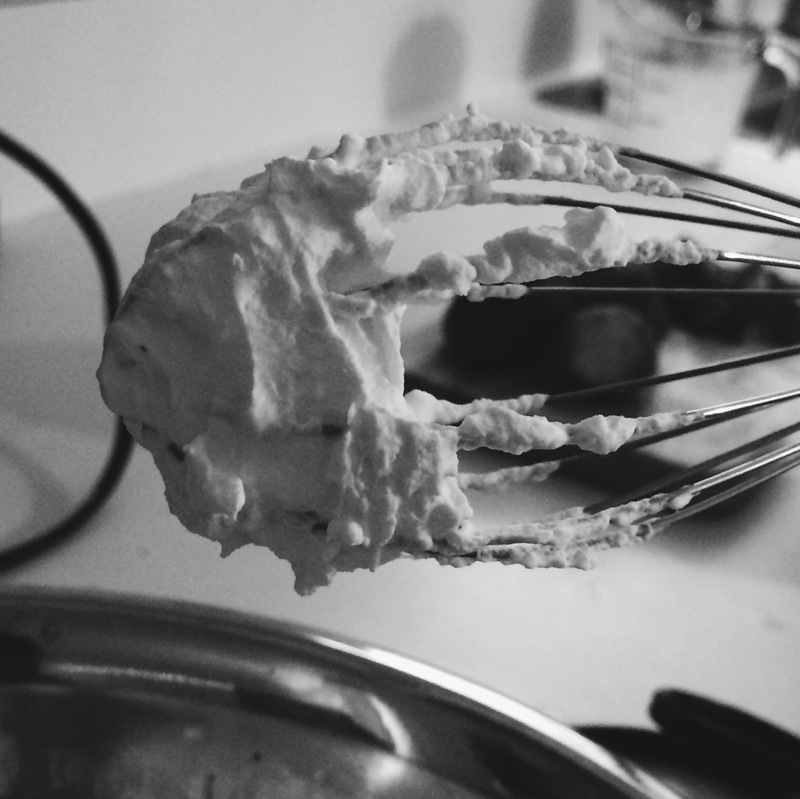 While those are baking you can make your whipped cream. In your chilled bowl with your chilled whisk attachment, beat the cream with the sugar, vanilla, honey and cinnamon on a medium speed until stiff peaks form. Set in the fridge until ready to use. Lick the spoon. Yes. 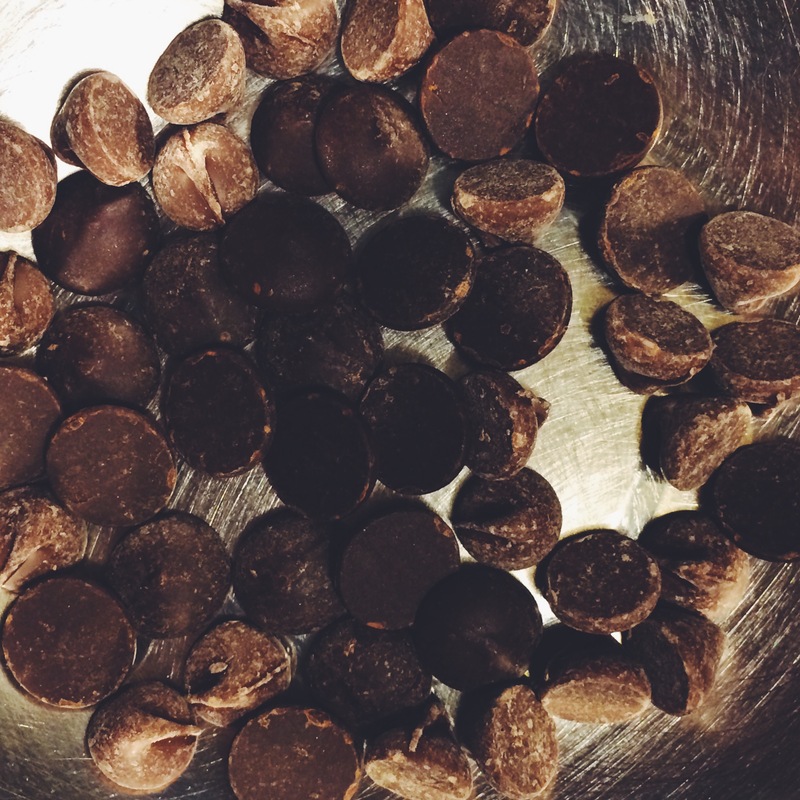 In your double boiler place your dark chocolate chips. If you do not have a double boiler grab a small saucepan and fill it with just enough water to substantially cover the bottom of the pan, but do not fill it up completely. You do not want to water to touch the bottom of the metal bowl. Place the metal bowl on top of the saucepan and over medium to medium-high heat and gently boil the water. As the steam rises it will melt your chocolate for you. Stir occasionally to help the chocolate melt and to get out any lumps. Turn burner down to low while you build the mini napoleons. Now for the assembly. 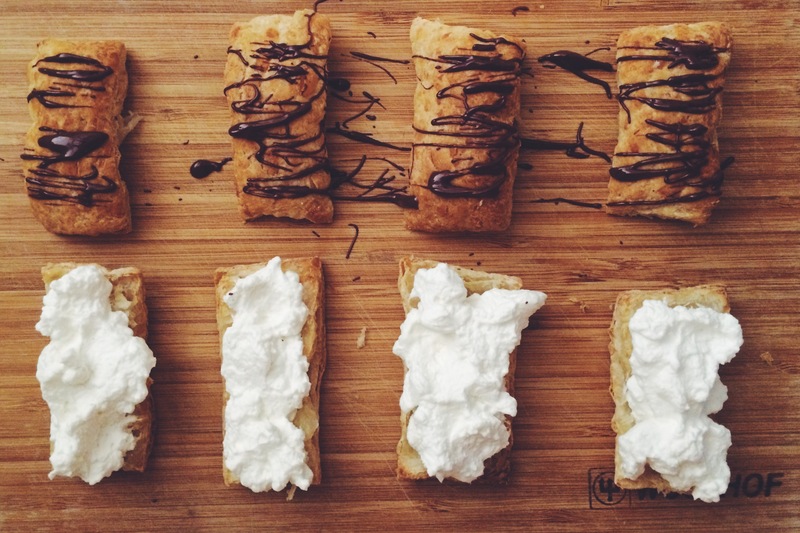 Take a bottom piece of puff pastry and smother it in the whipped cream, about two large spoonfuls. On top of the whipped cream add the fresh, diced strawberries. Top off with the top piece of pastry. Repeat with all of the pieces you have. Once they are all assembled place them in a line and with a spoon, drizzle the melted chocolate over the tops of the pastries. For the best experience eat them fresh. Otherwise hold them in the refrigerator for no more than about one day. The moisture and condensation in the fridge with influence the puff pastry and make it moist, dense and will take away any light, fluffy, crispiness. But seriously, can you resist these tiny little treats? I’m not sure you’re as tough as you think when these are in the room. Their small size and somewhat sugar control make them a not-so-terrible for you dessert. I’m not calling them healthy by any means, but moderation keeps you enjoying great foods that you love to eat! My game plan is to always share when I bake. I’ll eat one and give the rest away, which also spreads the joy!